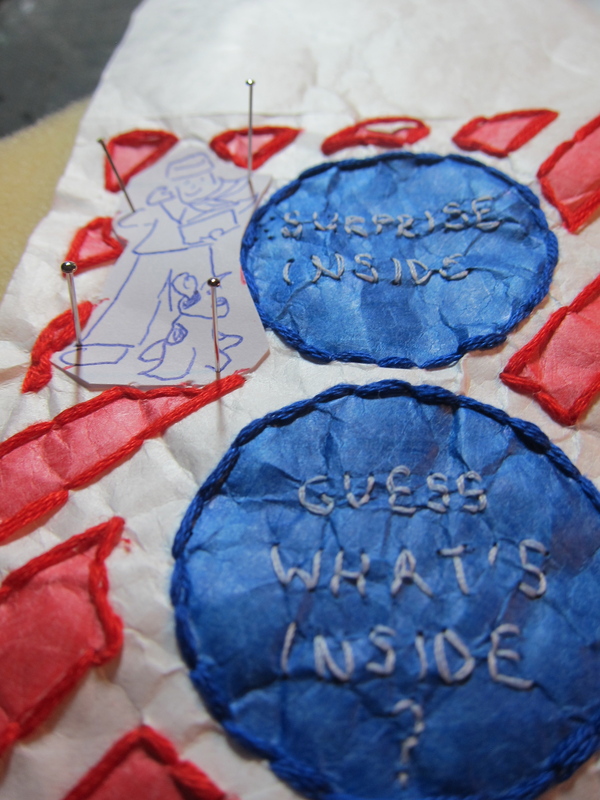 Book opened to show first two stanzas of the poem, "Sure of Heart," and the embroidered organs within the plastic rib cage. This book's head is stuffed with candy and fast food wrappers, and the mouth opens to reveal an accordian book full of tweeted/deleted texts sent by Donald Trump. 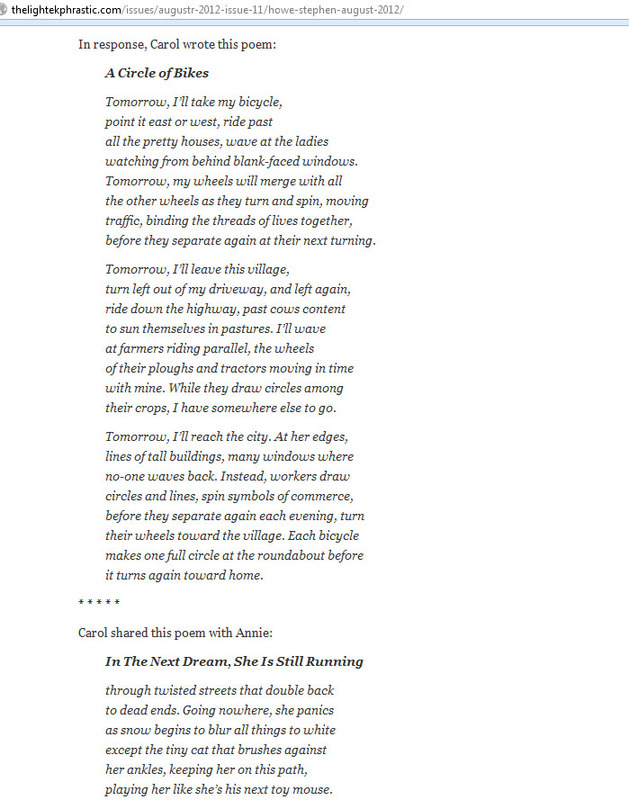 Five HTML poems chronicling the lives of Martha and Bill Hall, whose marriage has been strained following the loss of their son. home pages: 1-5 is a series of poems written in a variation of HTML code, focusing on the lives of Marth and Bill Hall, whose marriage has been strained by the loss of their baby, Joey. 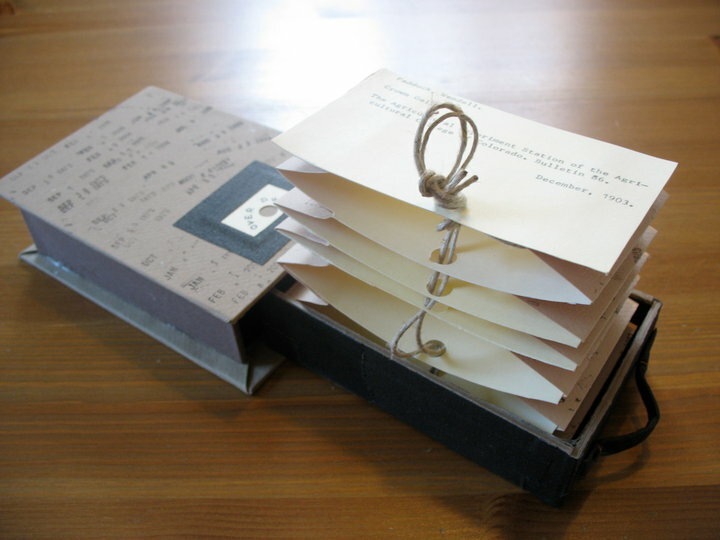 I wrote the poems a number of years ago, but only recently created a physical home for them. This book opens up to create a house-shaped form, with a room, a door, a driveway, and roof made of paper. 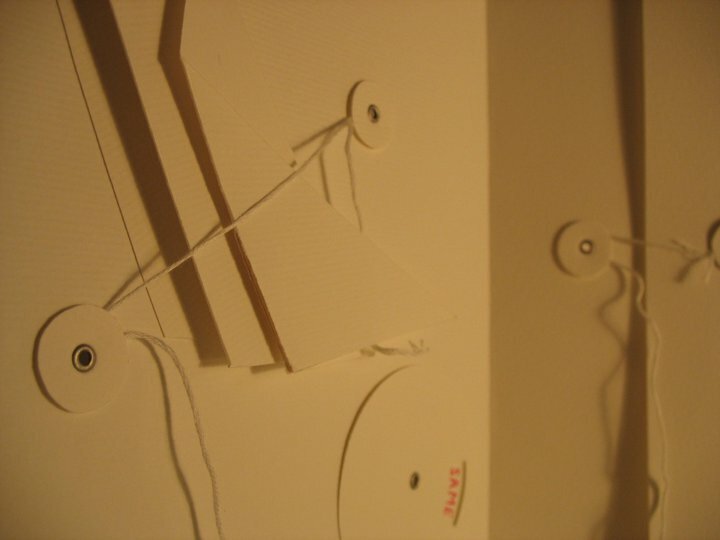 This is an edition of 50 copies, created in 2018. If a person was a book, what would it tell you? 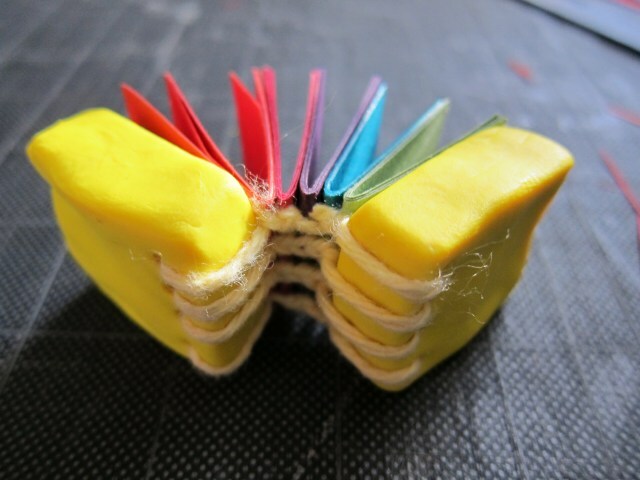 These small books, which take the shape of people's heads, hold stories and poems about the subject inside. This face book contains a man-splain-y sonnet titled "I don't remember asking you"
Poetry contained in "I Don't Remember Asking You" and "Origin Story: Paola"
Some of my poems wind up inside books; others do not. This is a selection of several I've written recently for purposes other than my own book binding. 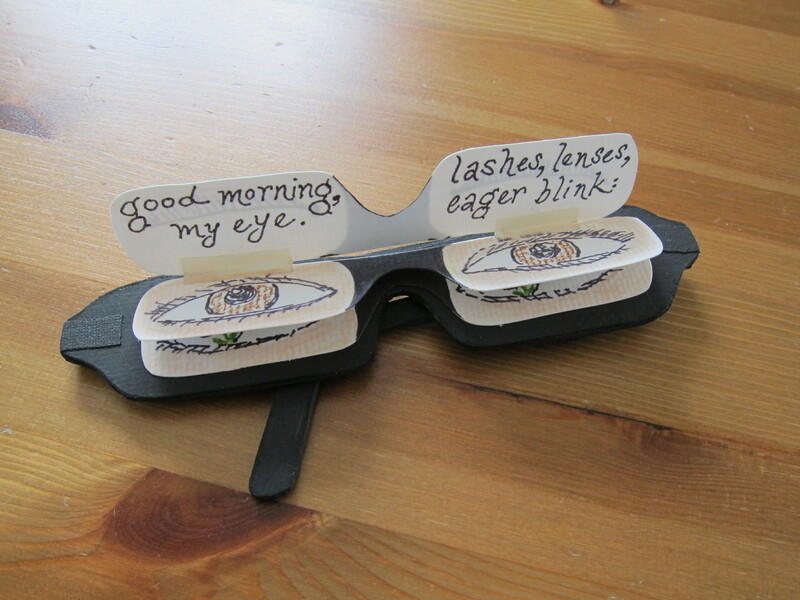 This collection of short poems was created as part of a visual collaboration with artist Dan Sherman. Based on the titles of books chosen at random from a bag-full of old library card catalog cards, I wrote this series of poems describing a not-so-lovely future in the not-so-distant future. 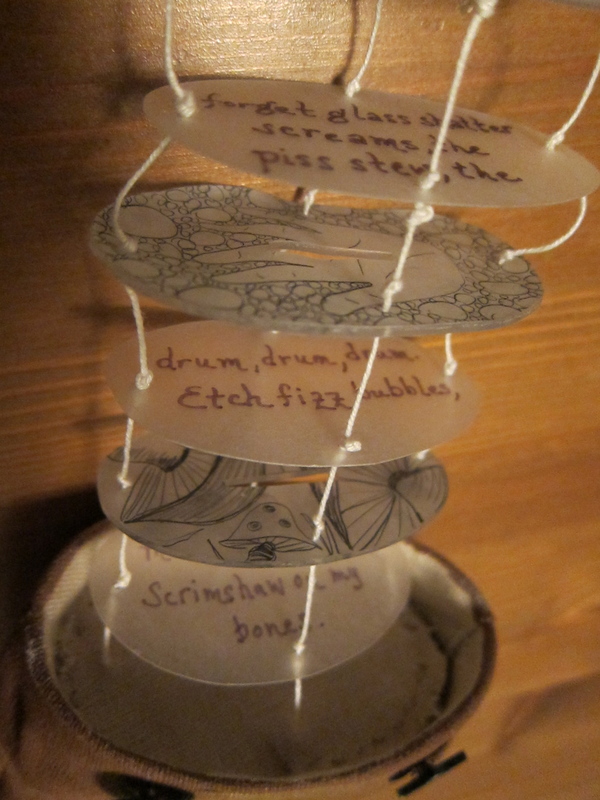 Based on the poems I wrote, Dan created several artifacts to accompany them. The artifacts and poems appeared together in a display at the Hamilton Gallery in fall 2018. Poem based on a news story. Sonnet written in response to a local artist's painting. 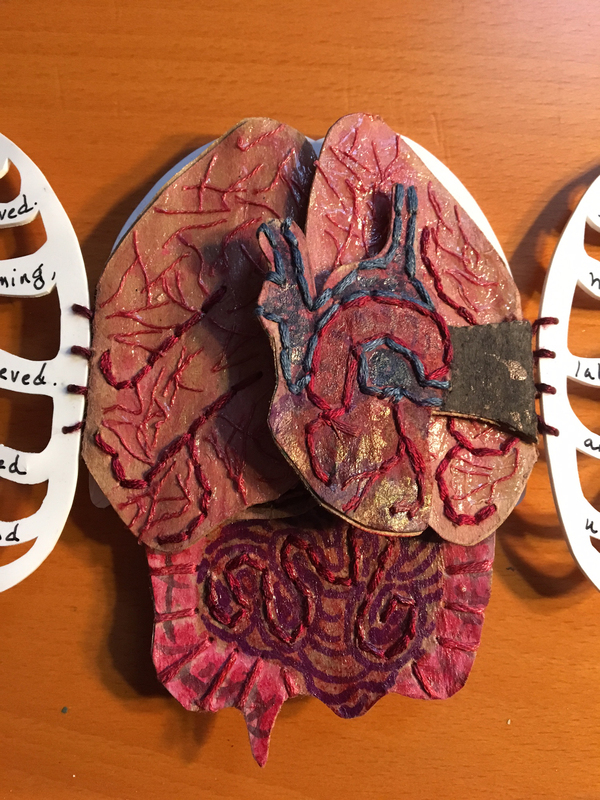 This book is contained within the rib cage and organs of plastic, thread and paper, with a poem that calls to the purpose of the body's most complicated machines. I started this in spring of 2016 as a challenge of form -- the body as a sort of gate-style coptic bind -- but found it came together emotionally after my husband underwent heart surgery later in the year. As I watched the echocardiograms, I marveled at the unknown landscape of machines working away for purposes they don't even understand. A quick video to show how my book functions. With hand for scale. 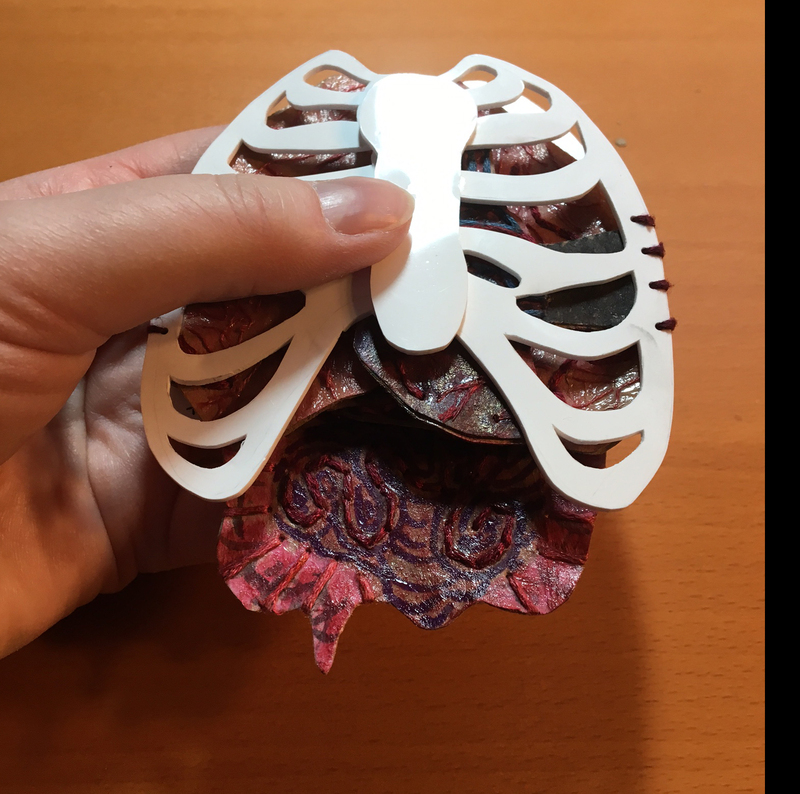 The rib cage is made of four pieces of shrunken polystyrene plastic, and sewn together in a gate-style double coptic bind. 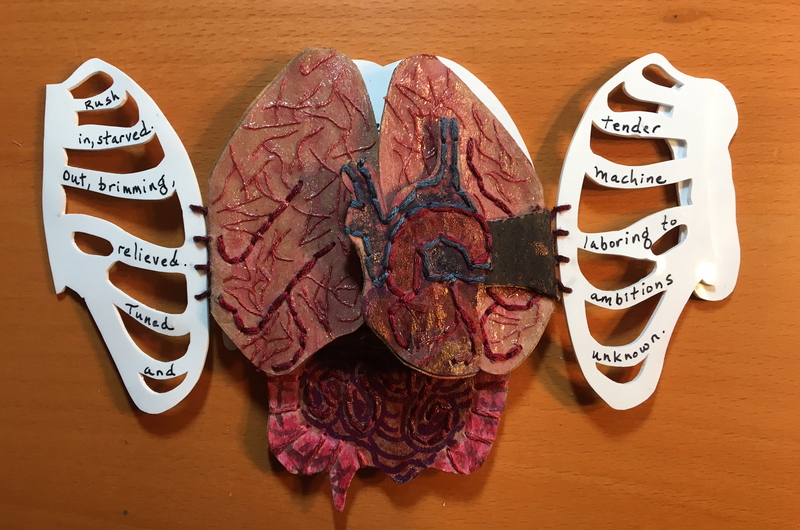 The paper and thread-embellished organs peek out from within. 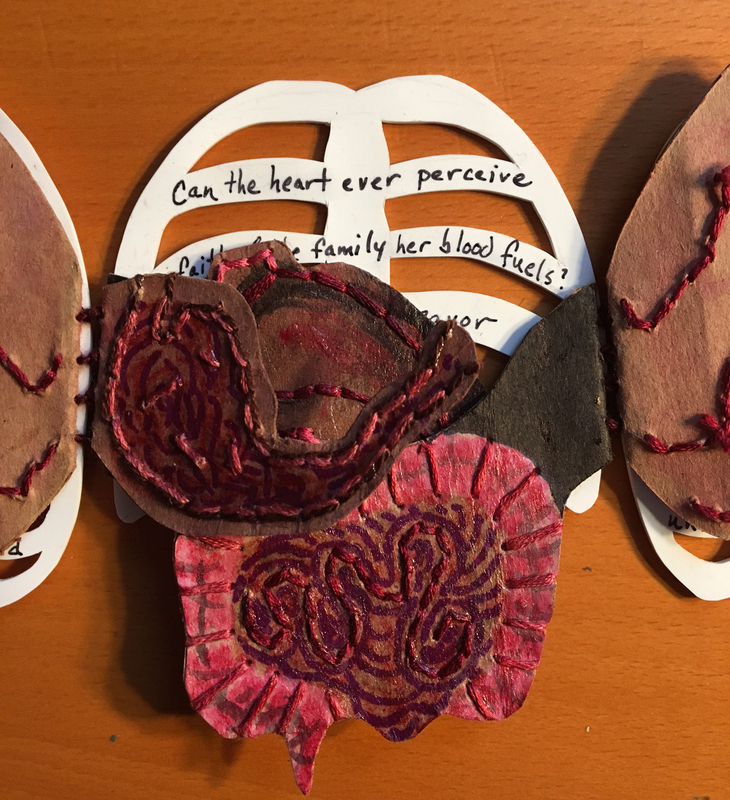 I used grocery bags for the organs, embroidering details with cotton thread, adding color with watercolor and marker, and making it glisten with a coat of glue. Close-up of stomach, intestines, back of rib cage. This is the poem within the book. 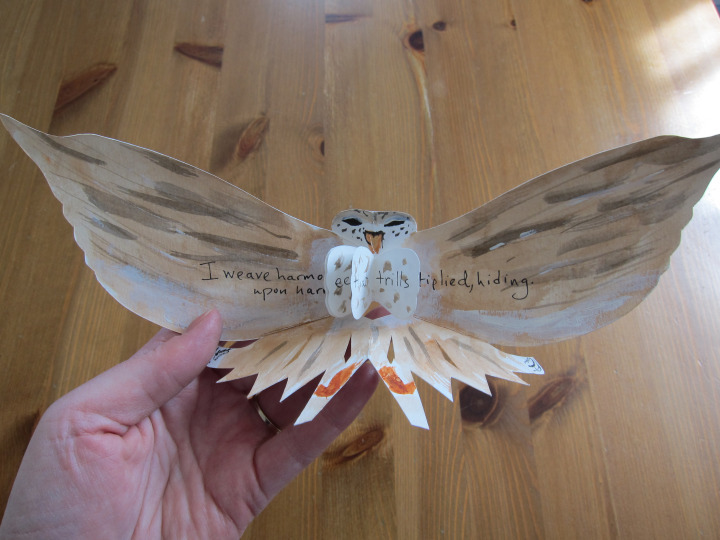 This work explores the legacy of lost birdsong through book art forms. 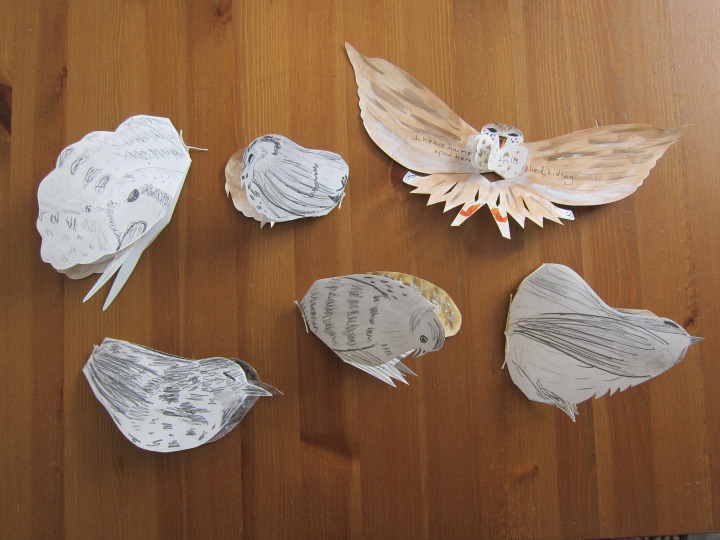 Each of the six books represents a commonly lost Baltimore bird. 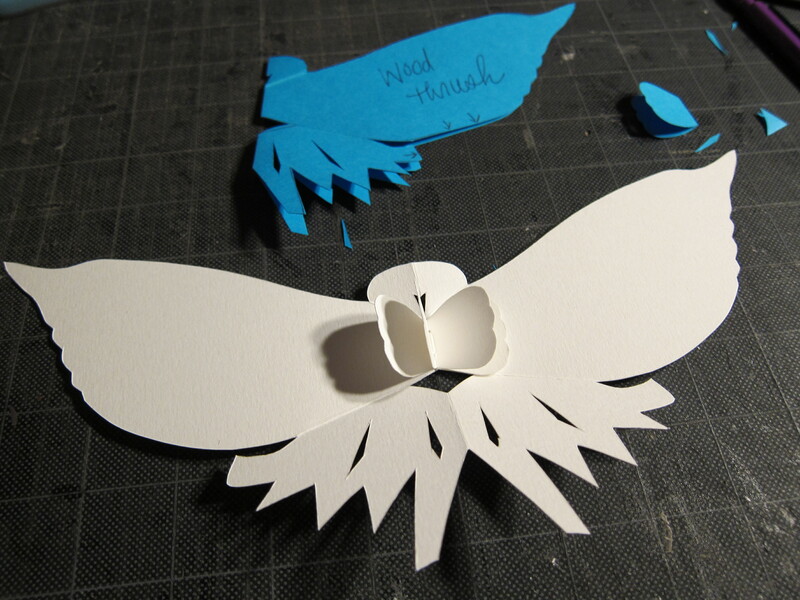 When the book is closed, the bird appears to be dead and devoid of color; when its pages are opened, the bird comes alive through colorful paper popups and poetry that reveal secrets of the voices lost to the lights. 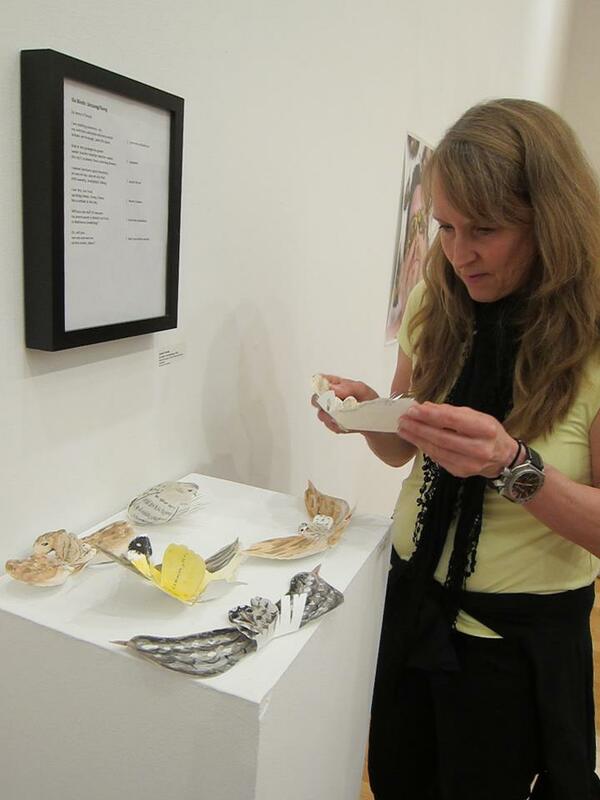 These were shown as part of Lynne Parks' group show Unfriendly Skies: Birds, Buildings, and Collisions exhibits at Goucher College and George Mason University in 2015. From "Unfriendly Skies: Birds, Buildings and Collisions" at the Silber Art Gallery, spring 2015. This is a dos-a-dos book, which means you can read it rightside up, or upside down. In one direction, it focuses on SKY, and the clouds and birds you might see there. 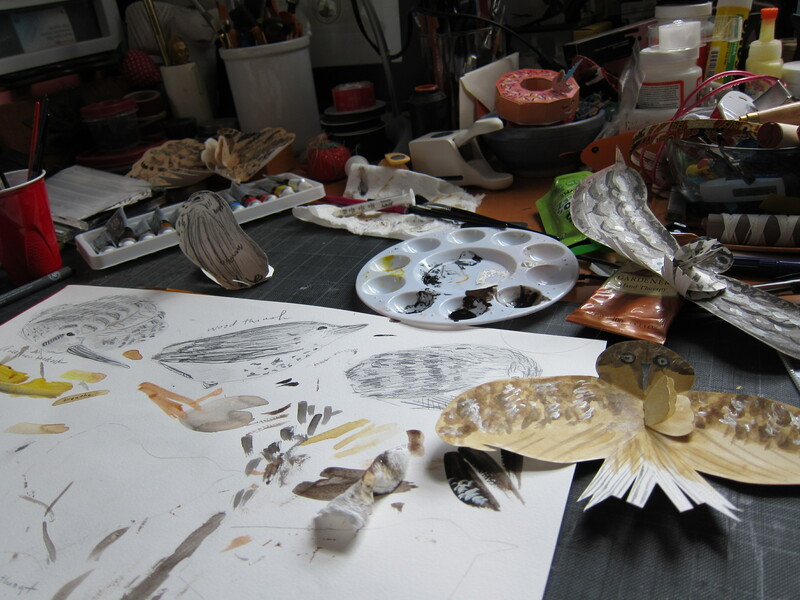 On the flip side, it focuses on SEA, where the reader sees an underwater seascape. Sea/Sky is made of a variety of fabrics. This was for the Amplified Cactus project, through which writers and artists responded to questions. 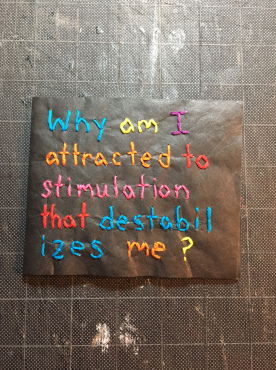 In this case the question was Why am I attracted to stimulation that destabilizes me? My response was Three Studies. Each “study” within the book is composed of a poem about a moment of destabilization (which slides neatly into the wallet-style construction) and an accompanying chart. The first spread contains a poem about how I chew my thumb ragged when I read. 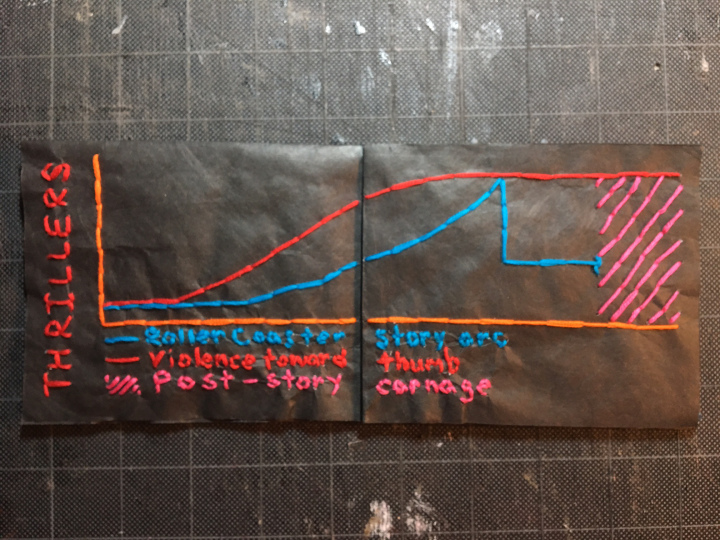 So, the line chart follows the “violence toward thumb” in relation to a thriller story arc. This project is part of Container's Multitudes series, which invites writers and artists to transform the same object into works of visual and literary art. In this series, participants were invited to interpret a vintage metal lunchbox. When I saw my lunchbox for the first time, I was SO excited. 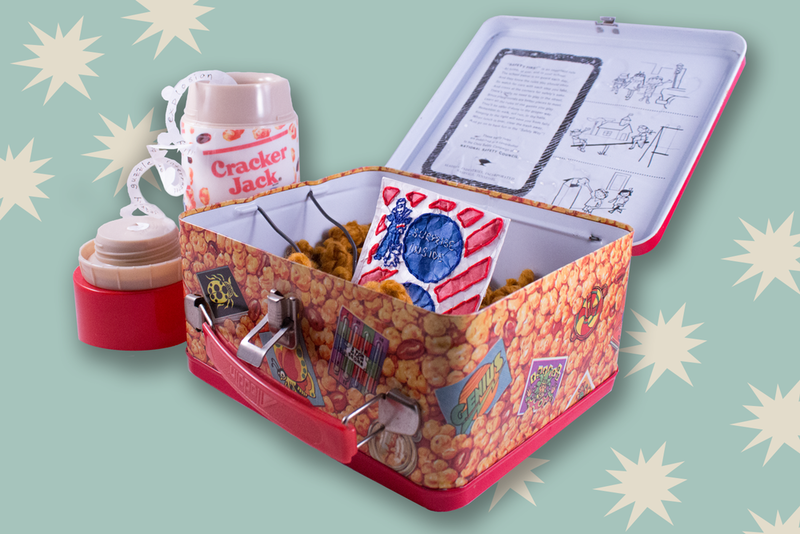 I have always loved the packaging for Cracker Jacks -- especially the tiny folded joke prize booklets. I love the little structures, and I adore the fact that the jokes are always terrible. 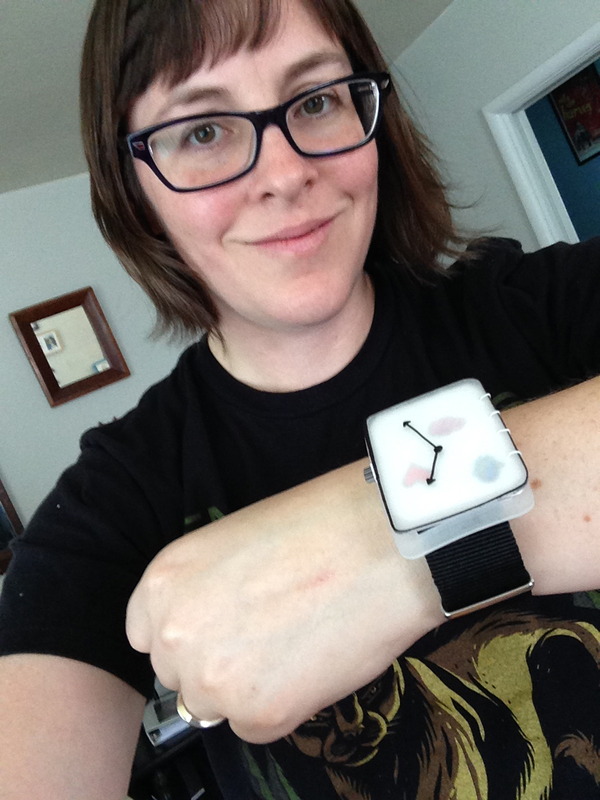 A play on the Apple Watch made with paper and polystyrene plastic, this book contains a short poem about the parts of life (heart, mind, etc.) 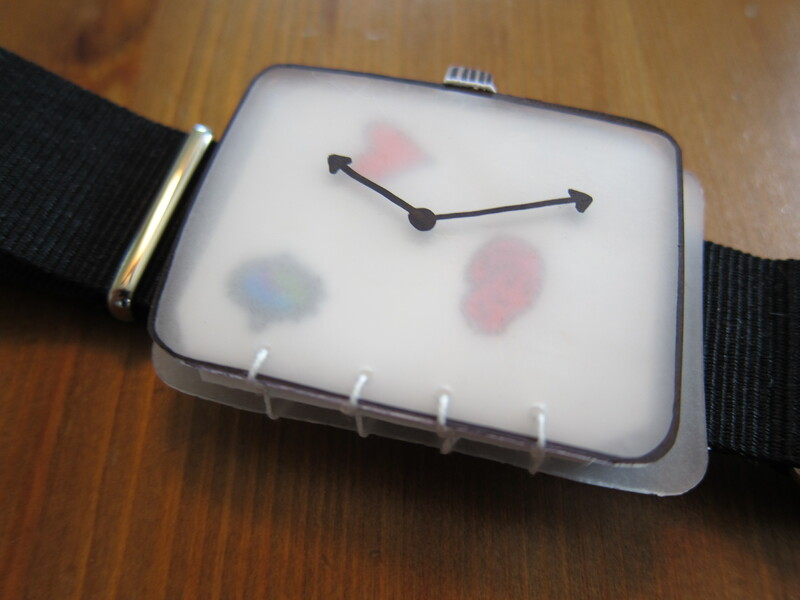 the watch might "track" for you, along with illustrations of those life icons. This book was a part of the "Beyond the Margins" display at Loyola University in 2016. 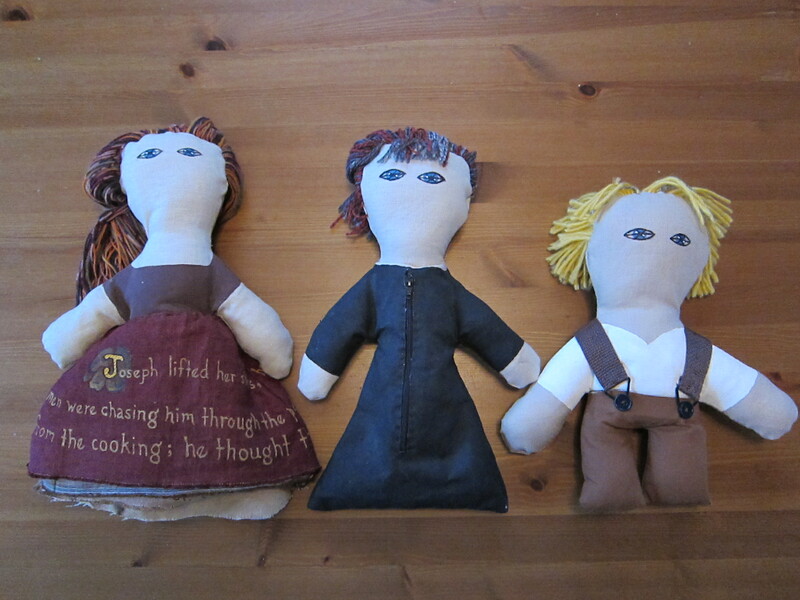 This trio of fabric book dolls is based on poems I’ve written about characters in the Günter Grass novel The Tin Drum. They represent three generations: Anna Bronski (the grandmother); Agnes Matzerath (the mother); and Oskar (the son, and the book's protagonist). 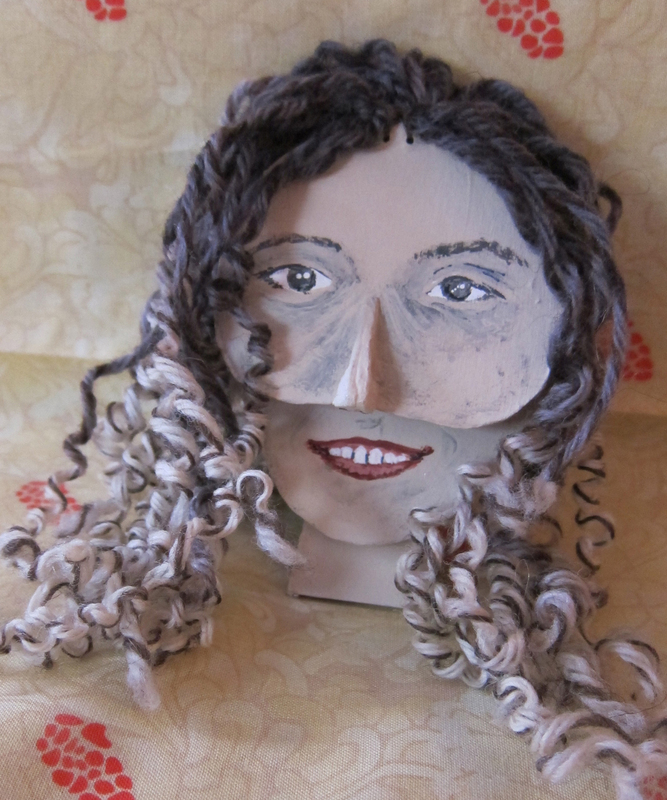 I've tried to make the physical experience of reading each poem doll mirror an aspect of the doll's character, and also somewhat intrusive -- as each poem touches on private, uncomfortable moments of their lives. 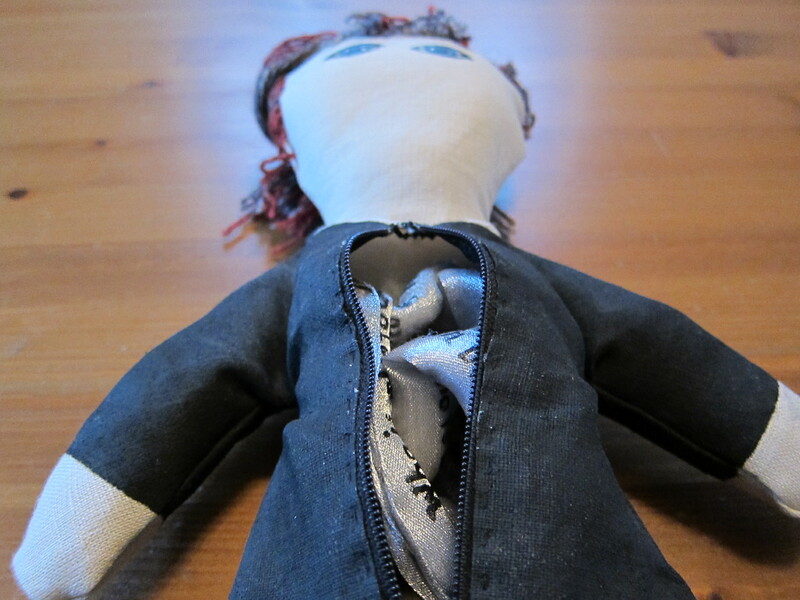 You must lift a skirt, or unzip a dress, or unbutton suspenders to read their stories. 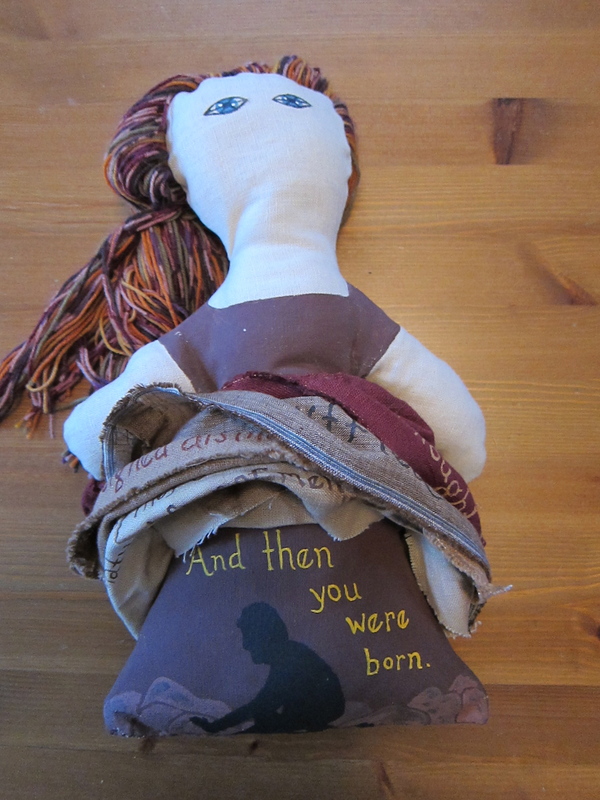 You can hear each poem and see the dolls in action by viewing the attached video. 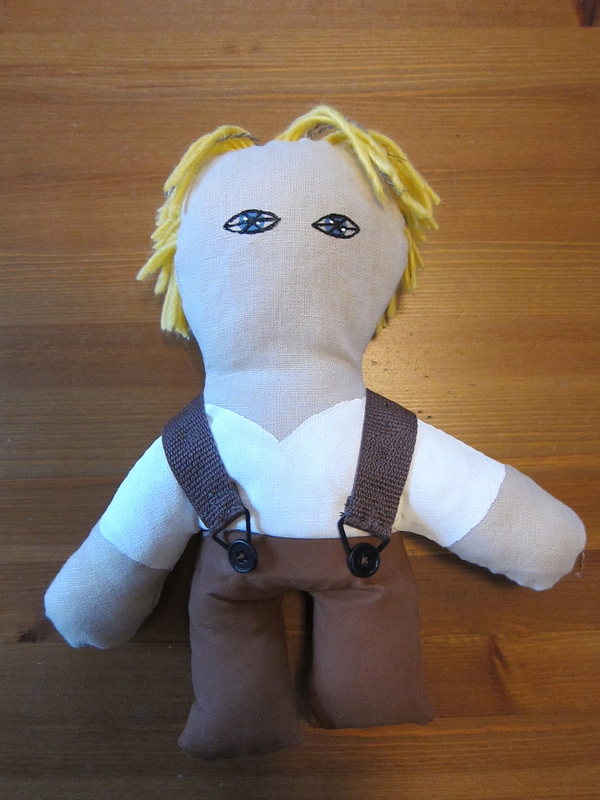 Oskar, the unreliable narrator of the book, wills himself to stop growing at age three. Eventually, out of grief or madness, she poisons herself by eating eels caught by her husband. Anna's skirts are the pages of the book. 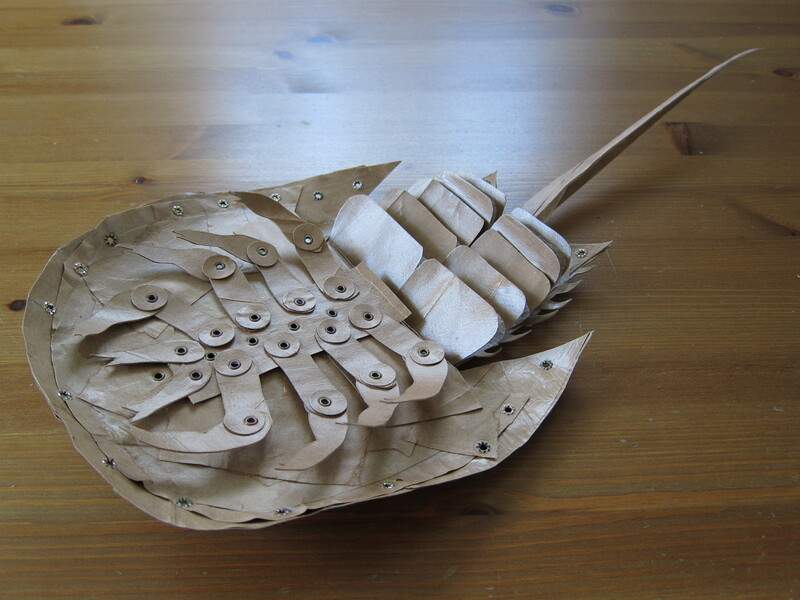 This "living fossil" book sculpture is made mainly from paper bags, eyelets and glue. 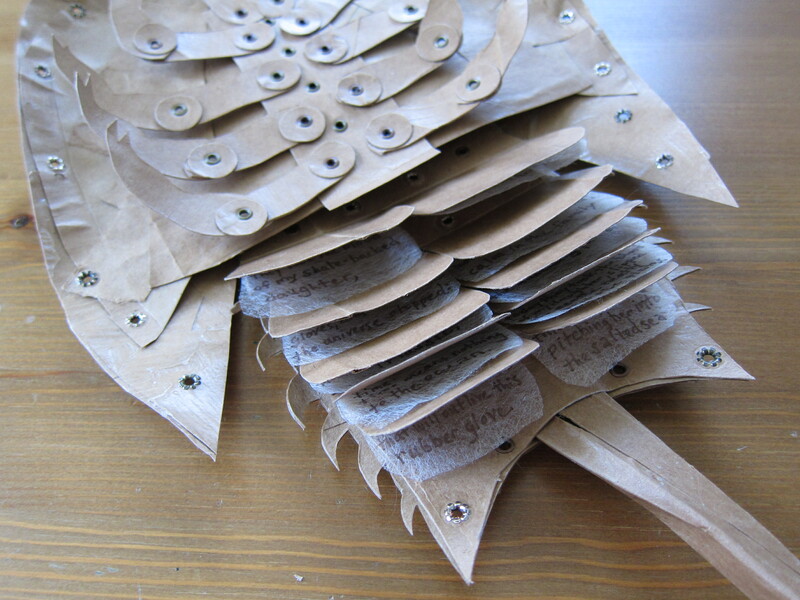 A poem is hidden within the horseshoe crab's book gills -- one stanza per segment. The legs, tail and gills move, as do the front and middle sections of "carapace." 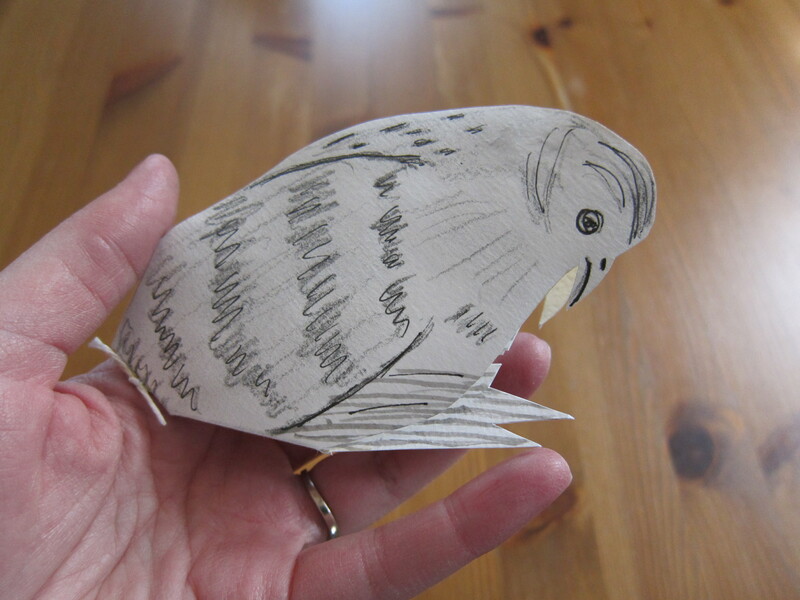 You can read more about the project here: http://kineticprose.com/2013/04/22/living-fossil-book/. 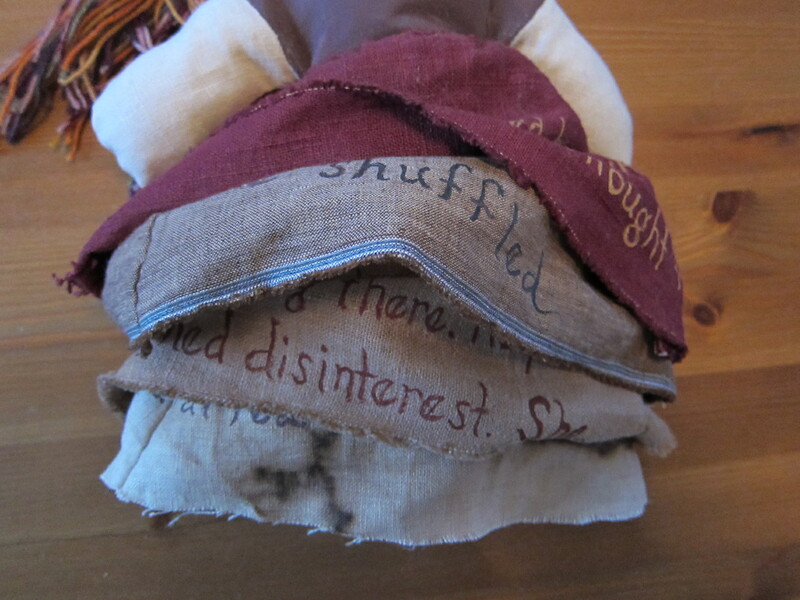 I have made many, many books of poems, paper, fabric and other materials. These are a few of my favorites. 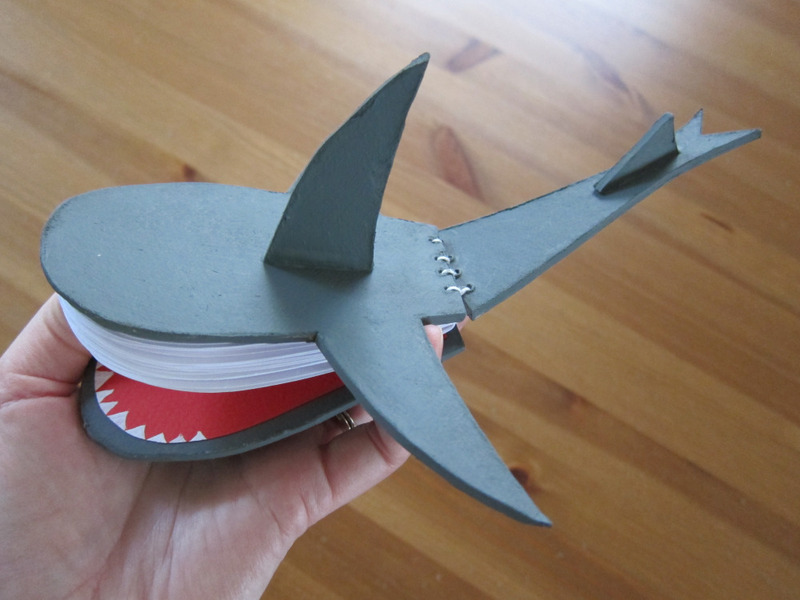 Shark Book is made from binder board and paper, and opens mid-way into a coptic-bound book that reveals a set of scary shark teeth! Made in 2014. More about this online at http://kineticprose.com/2014/06/22/falling-behind-catching-up/. 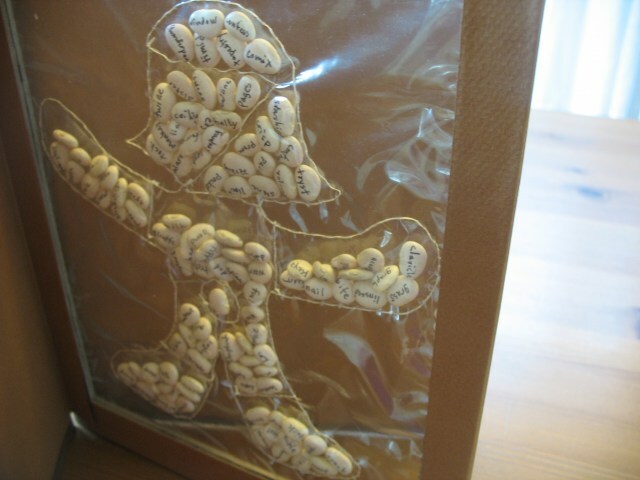 Inside of book, bean poem, hand sewn into plastic. 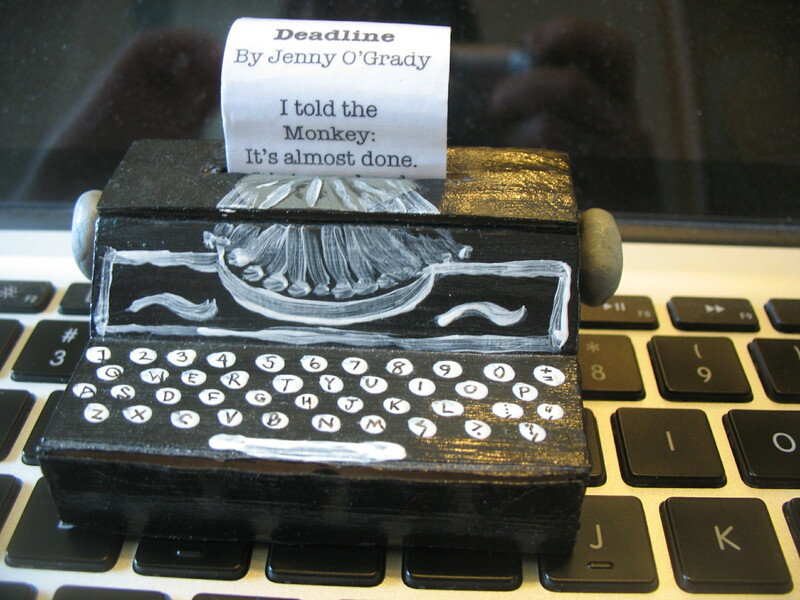 Deadline is made of corrugated cardboard, Sculpey clay, paint, a long matchstick, packing tape and white xerox paper. It unrolls to reveal a poem of the same name. 2005. 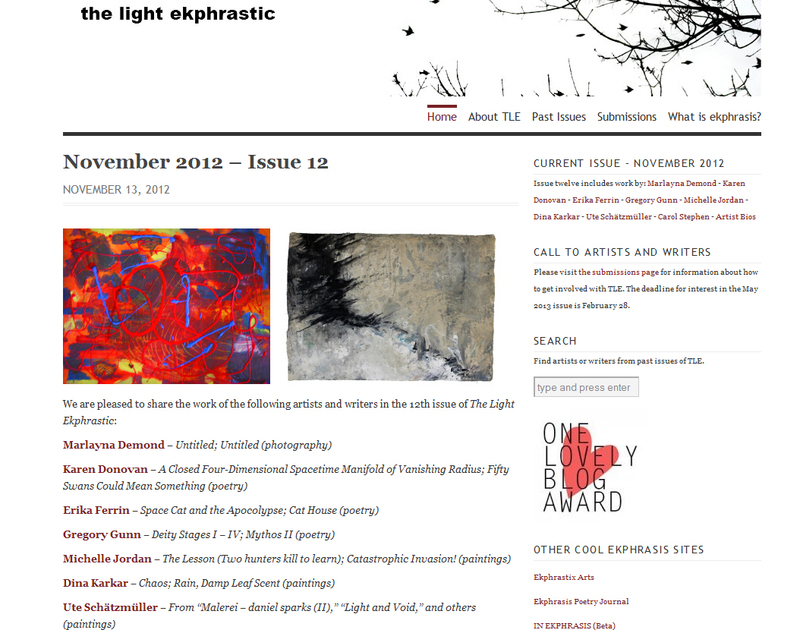 The Light Ekphrastic is a quarterly online ekphrasis journal that has paired writers and visual artists of all types to create new pieces based on previous work since November 2009. Many contributors are from the Baltimore-D.C. area, but others come from as far away as Canada, Australia and Germany. 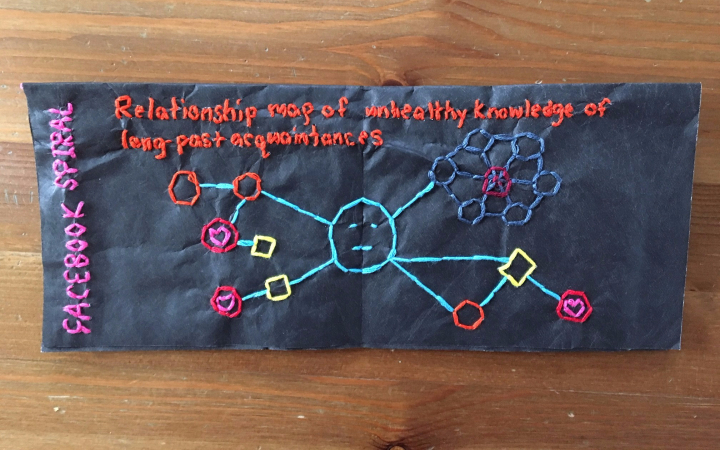 The Light Ephrastic paired with LED Baltimore in March 2015 to curate The Baltimore Ekphrasis Project, through which we paired 66 artists and writers from the Baltimore area to create new work that was displayed on the LED Art Board next to Penn Station, as well as in a special online issue of TLE. A reading/pop-up art show was held at UB, with more than 100 guests in attendance. Photos below attempt to show how this process works, but it's much better to visit the real thing at http://www.thelightekphrastic.com. 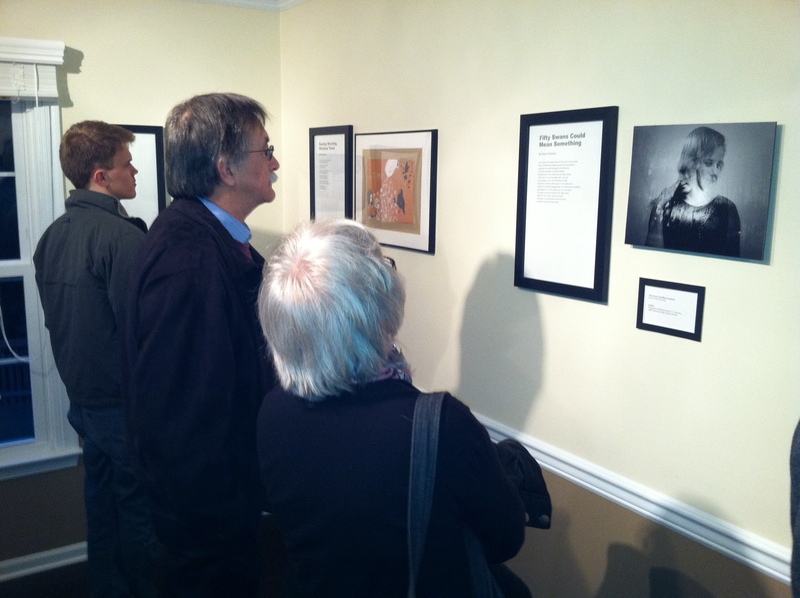 We held our very first show of pairings of art and writing at the David Mikow Gallery in Catonsville in February 2013, and again at the same location in February 2014, both times bringing together artists and writers who had previously only met online to discuss their processes in responding to each others' work. 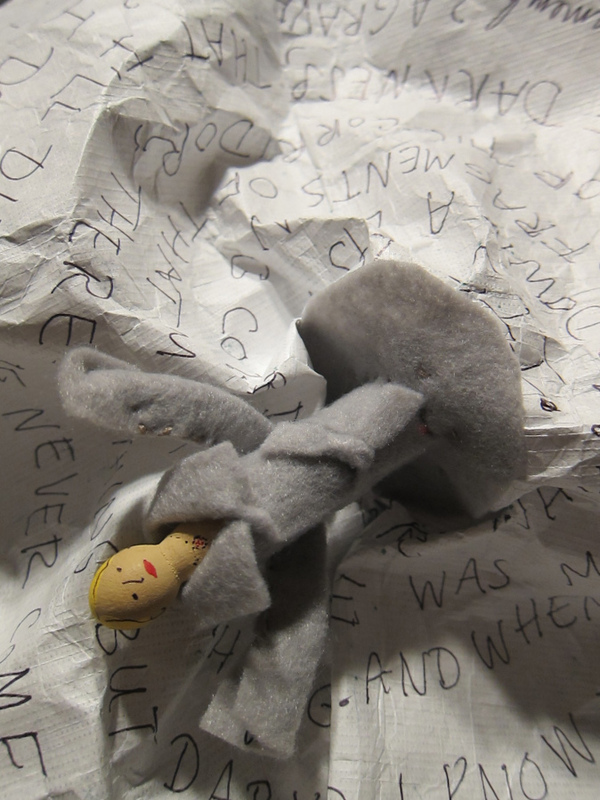 Part III: The finale of a poem, and the artist's new response to it. 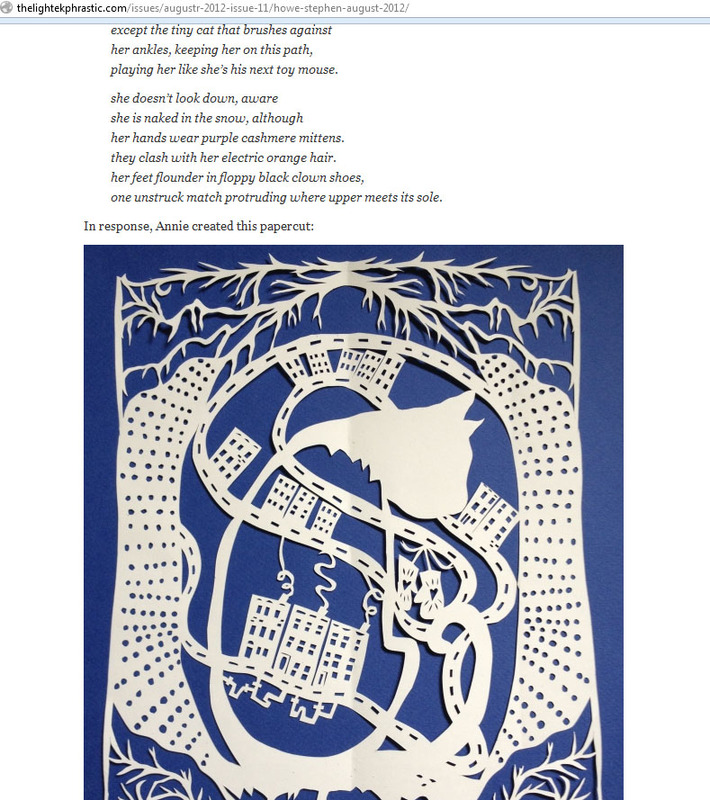 Part II: Poetic response to artist's work, then part of the poet's original submission to TLE. 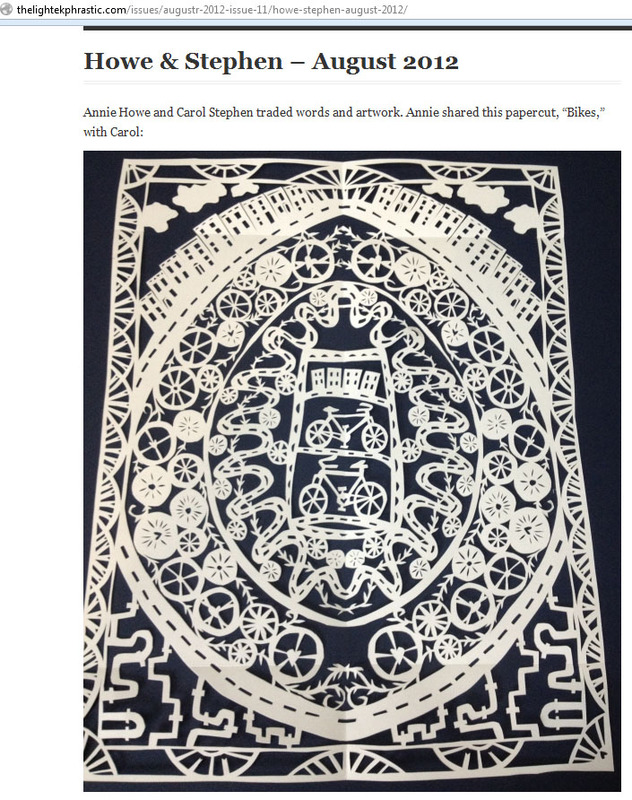 Part 1: Top of page, a visual artist's submitted work. The Light Ekphrastic held its very first non-virtual appearance with a show at The David Mikow Art Gallery in Catonsville. The show had a special focus on contributors from UMBC and surrounding community and featured an informal discussion by artist/writer pairs about the ekphrastic processes they used to create new works inspired by the works of their partners. 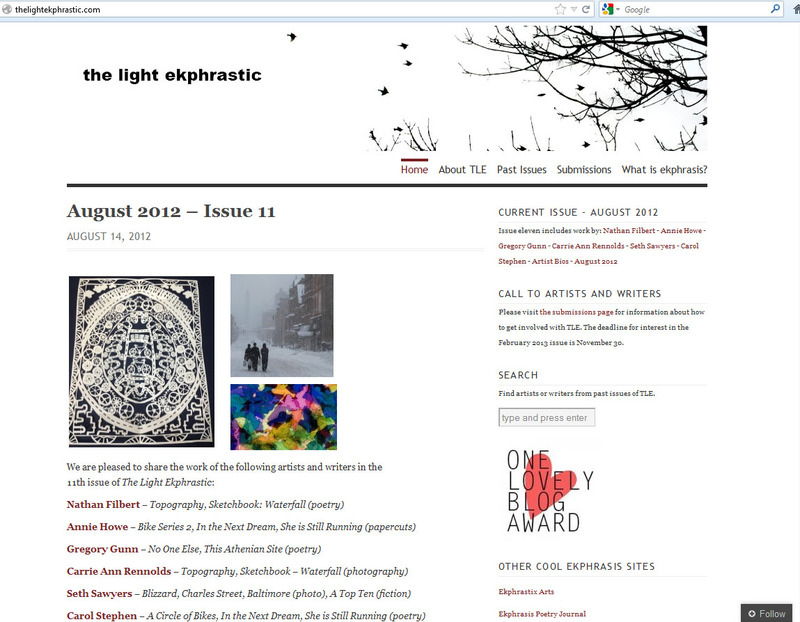 Screen shot of The Light Ekphrastic home page, August 2012 issue, featuring writers and visual artists who have been paired to create new work.